Presidential hopeful of the opposition National Democratic Congress (NDC) Augustus Goosie Tanoh has kick-start a nationwide campaign tour to lead the party in the 2020 presidential election. Mr. Goosie Tanoh began his tour on Wednesday with a 6 day visit to the Volta region where he urged delegates to consider allowing him to lead the NDC for the first time as the party presidential candidate. 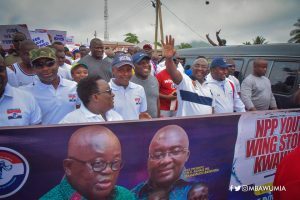 He is expected to tour a number of Constituencies in the Volta Region with his "competent, principled and Accountable leadership" message to woo delegates to vote for him. The experienced politician also met and interacted with delegates at Keta Constituency on Thursday, October 11, 2018. Asked what he will do if he does not win the race, Mr. Goosie Tanoh said "I will remain in the party and continue to support the party for victory 2020". He told delegates not to lose hope because he was confident of winning the flabearearship slot with his "scientific organizational skills". Per his itinerary released and copied to Bestnewsgh.Com, Mr. Tanoh is expected to meet several NDC delegates across the region including regional executives among others. The NDC has set December 7th, 2018 to conduct elections to select a flabearear for the 2020 polls. Aside from Mr. Goosie Tanoh some eleven other bigwigs in the party have expressed interest in leading the party into the 2020 elections. Alban Bagbin, Second Deputy Speaker of Parliament, Stephen Atubiga, member of NDC communications team, Elipklim Agbemava, a lawyer; David Doste Kwame Kuwadah; and a banker and oil and gas consultant, Nurideen Iddrisu.